When Laura approached me to do a book review of her very first ebook I was pretty excited, ok wait let me rephrase, I was extremely excited! This being her first ebook I was afraid that I would not do a good job, I tried to google for some pictures on the book but found only a handful. Nevertheless I decided to go ahead with the review, it is an opportunity not to be missed! 10% of profits made will go to Baby Lifeline, charity which supports the care of pregnant women and babies in the UK. 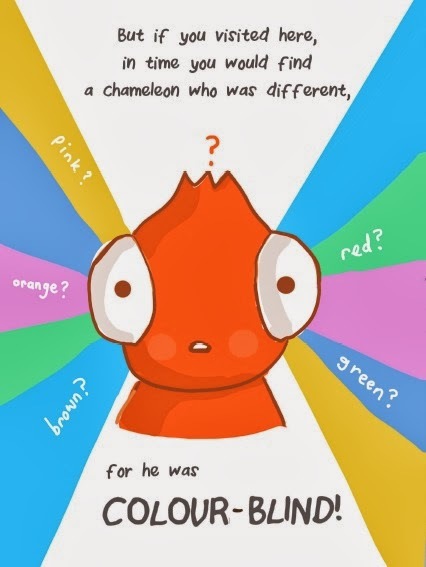 Tell me, how can you not smile when you see such a bright orange colour, cheerful, friendly chameleon in his cute little blue pants and red socks? I'll admit shamelessly that I had this big grin on my face and went squealing "OH! Sooooo CUUU-tteee!!!" and fell in love with this little reptile. Uh-oh... being colourblind is a serious problem for a chameleon and being one who does the wrong things at the wrong time can sometimes be very lonely. Well, all is not lost, for he found happiness some where in a not so quiet corner of the great Amazon. This book may look simple but it shares many values in the story. It teaches compassion, empathy, understanding and tolerance, some of the traits in building a good character. This book touches something close to my heart, with a sensitive and sensible child who matures earlier then his peers, I have to constantly remind him that it is O-KAY to be different. 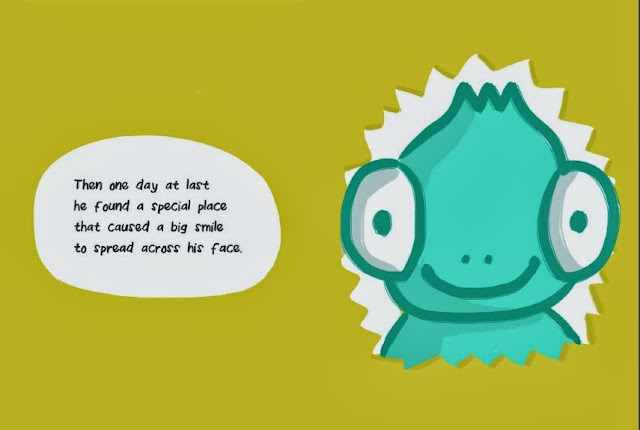 This book will tell him that there are others who feel the same as him and as with the chameleon, one day he will also find "a special place that caused a big smile to spread across his face". This is a good read aloud book with the younger children, the vibrant colours and the rhyming verses will keep them glued to the book. Parents can also take this opportunity to teach them about colours and the different animals they will find in the book. 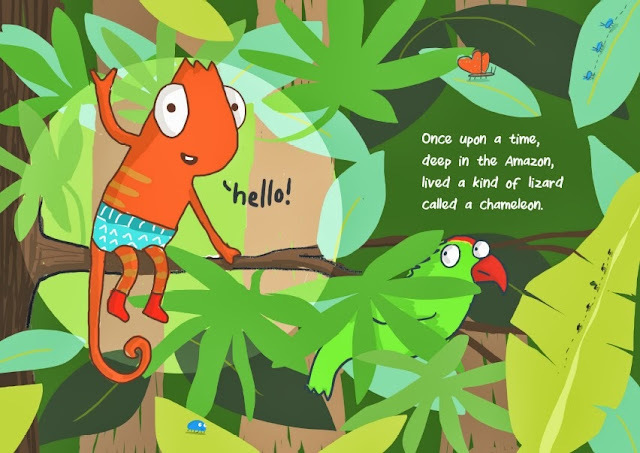 With the slightly older children, an exploration about chameleons and the great Amazon rainforest is a must! I also took the opportunity to pop by illustrator Sarah Ray's facebook and instantly love her work. Her drawings gives me a feeling that she sketched them on spur of moments (while having a cuppa on a lazy afternoon nonetheless) thus making them look so realistic and I like her sometimes rude & raw wording on her drawings. You'll frown when you read the wordings on her drawings, at the end of it you have to agree or smile at it. That's just me of course, take a look and see if you share the same feelings. 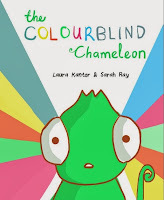 Laura Kantor, Author of The Colourblind Chameleon and Founder of Squidgy Face Books, grew up in Coventry, England, but has spent the last few years living overseas in Canada, Australia and now Singapore. In her free time she loves to travel, bake and write (of course!). Laura’s writing is inspired by people she knows, with many characters being based upon her family and friends (and their unusual features!). Her work stars animals who don’t necessarily fit in with the rest, and the key message in each of these stories is that being different is a good thing and that there is a place for everyone in this world. Early in 2013, Laura decided to self publish her own stories, and set up Squidgy Face Books (www.squidgyfacebooks.com), teaming up with Sarah Ray who was the perfect illustrator to bring her stories to life. A year of very late nights, lots of coffee and extremely long weekends later and their first release, The Colourblind Chameleon is ready to bring some colour and fun to squidgy faces around the world! This is Sarah’s first children’s book, after working with a variety of clients on commissioned illustration. She also has her own range of award winning greeting’s cards which she sells across the UK, http:// www.sarahray.co.uk. 1. 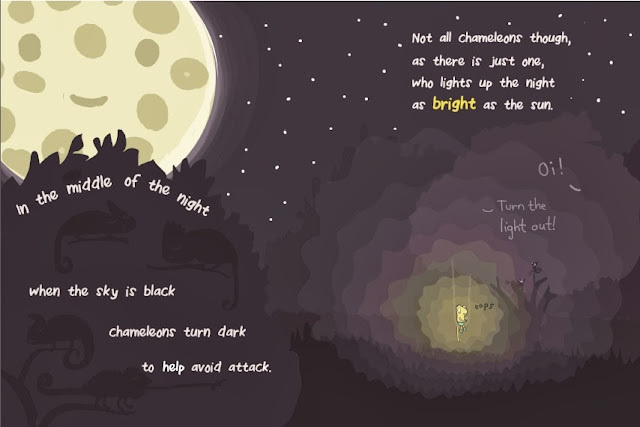 Prize: 2 lucky person will each win a printed and signed copy (limited edition) of The Colourblind Chameleon. 3. Giveaway will run from 11 December 2013 till 24 December 2013 @ 2359hrs and winners will be announced in our blog and facebook page. 4. Giveaway is open to Singapore only. 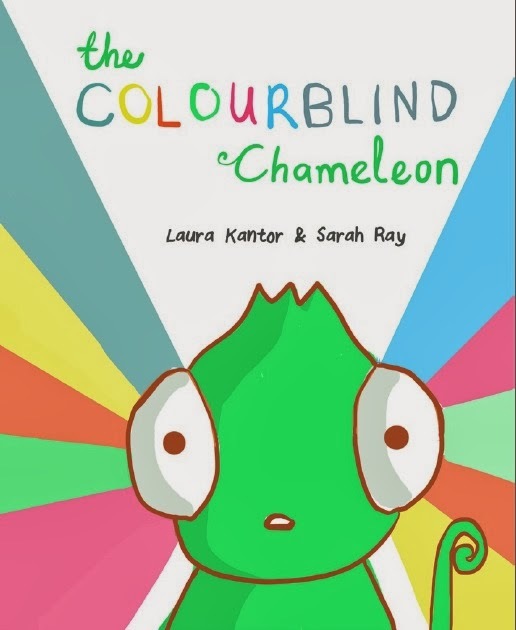 Disclaimer : We received a pdf copy of the book The Colourblind Chameleon for the purpose of our honest review. Laura has generously given us a signed printed copy of the book but we decided to give them up as one of the giveaway prize. Interesting book. Thanks for hosting the giveaway. Pls enter using the rafflecopter. There isn't any box to enter email add at the Rafflecopter dear.